The perfect mid-week meal this healthy recipe will some become one of your go to choices. 1. Heat ½ tbsp oil and 15g butter in a large frying pan. Add the courgettes, season, and fry over a low-medium heat for about 15 minutes, until just golden; set aside. 2. Meanwhile, heat the remaining oil and butter in a large sauté pan. Sweat the leeks and celery with a pinch of salt over a low-medium heat for 10-15 minutes, until soft. Add the rice, stir for 2 minutes; pour in the wine and stir until absorbed. Meanwhile, pour the stock into a pan and bring to the boil, then turn down to the lowest heat. 3. Add 2 ladles of stock to the rice and stir until absorbed. Keep adding the stock like this until the rice is al dente (16-18 minutes). Stir in most of the courgette, the lemon zest and juice, and cheese; remove from the heat and leave to stand, covered, for 2-3 minutes. 4. Divide between plates and top with the remaining courgette, the rocket and the 5g grated cheese. 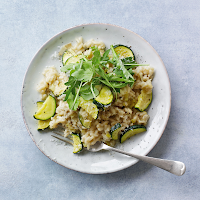 Using a large wide-based sauté pan means the stock will evaporate more quickly, so the risotto takes less time to cook.